Felder Rushing, coauthor of Passalong Plants, says that four-o-clocks are a "can't fail perennial." Gardeners in colder climates utilize them as annuals, but in most of the South they develop fleshy tubers that seem to last forever. Hortus Third says that these tubers can weigh as much as 40 pounds in warm climates. Dr. Alice Le Duc, now at Duke University, did her doctoral thesis on four-o'clocks and found that they were cultivated and selected for various colors by the Aztecs many years prior to the Spanish Conquest. They were sent to Spain from Mexico in the 1500's and to England within 75 years. The plant had been in cultivation in Europe for about 200 years before Linnaeus first described the species in 1753. The specimens he described were those of cultivated plants. Although often found in Mexico and the South on old garden sites, this species is no longer found in the wild in Mexico. Four-o'clocks are lush and bushy to three feet. the tubular flowers bloom in irridescent purple, white, red, yellow and striped. Their name derives from the fact that their flowers open in the late afternoon and stay open until the next morning, except on cloudy days when they open earlier. The fragrance of four-o'clocks is appealing, and is a major reason for their popularity. They also attract hummingbirds and moths to the garden. Four-o'clocks are very heat and drought tolerant. They flower well in the sun or fairly dense shade. I remember visiting a cemetery on a ranch near Yoakum, Texas, where four-0'clocks were the only reminder of a once well-tended plot. They had escaped the small fenced area under a great live oak tree and were happily flowering in profusion during the hottest time of our summer. Thomas Jefferson grew what he referred to as the "fragrant Marvel of Peru" at Monticello, where he also cultivated M. longiflora, a creamy-white flowering species native to West Texas and Mexico. A few years ago, while working with Peggy Cornett, Director of the Historic Plant Collection at Monticello, we were able to provide seeds of this plant to Monticello. It is once again growing there and is available through their mail order catalog. 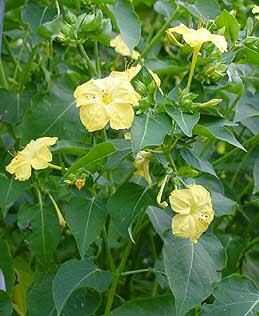 Four-o'clocks may be easily started from seed or tubers. In colder parts of the country the tubers may be dug in the fall and stored until spring. They tend to produce a great deal of seed and can become pests, although the young seedlings are easily pulled or hoed. One year, I planted a number of magenta colored four-o'clocks at our farm and they had reseeded prolifically by early fall, covering an area about 6' x 20.' It was an unusually dry year and the young plants received no irrigation. They were wilted and stunted until the first good fall rain when they miraculously freshened and covered themselves with flowers in just a few days. They were as showy as azaleas for that period, and I had a new appreciation for their old name "Marvel of Peru."